The Federated States of Micronesia is an island nation located in the Pacific Ocean, northeast of Papua New Guinea. The country is a sovereign state in free association with the United States. Present concerns include large-scale unemployment, overfishing, the environment, and over-dependence on U.S. aid. 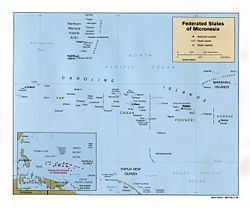 The Federated States of Micronesia is located in the region known as Micronesia, which consists of hundreds of small islands divided in seven territories. 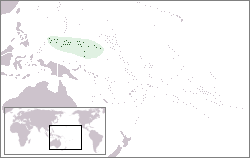 The term Micronesia may refer to the Federated States or to the region as a whole. The country has recently set up politically, resulting in decreasing value placed on the role of the traditional leaders. Although this is a poor island territory, there is no hunger due in large measure to the naturally occurring fruits, vegetables, and fish. However, poor financial management has created problems, and there are growing concerns about environmental issues. Micronesians by nature are peace-loving. The family unit generally has been very strong but has been challenged by the move toward modernization. The Federated States of Micronesia consists of 607 islands extending 1,800 miles (2,900 kilometers) across the archipelago of the Caroline Islands east of the Philippines. 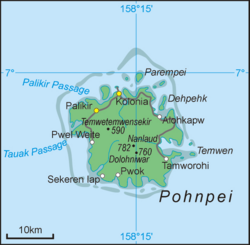 The four constituent island groups are Yap, Chuuk (called Truk until January 1990), Pohnpei (called Ponape until November 1984), and Kosrae. These four states are each represented by a white star on the national flag. The capital is Palikir, on Pohnpei. The island group is located about three-quarters of the way from Hawaii to Indonesia. Separated from the four main island groups are the islands of Nukuoro and Kapingamarangi, which geographically and politically are part of Micronesia, but linguistically and culturally form part of Polynesia. The languages spoken on these two islands are of the Samoic family of Polynesian languages. The islands' land area, 271 square miles (702 square kilometers), is four times the size of Washington, D.C. The islands vary geologically from high mountainous islands to low, coral atolls. The coral atolls consist of several small islets within a fringing reef, arranged around a central lagoon. There are volcanic outcroppings on Pohnpei, Kosrae, and Truk. The highest point is Totolom, at 2,595 feet (791 meters), on Pohnpei. Natural resources include forests, marine products, and deep-seabed minerals. The climate is tropical, with even, warm temperatures that range from 79 °F to 81 °F (26 °C to 27 °C) throughout the year. Rainfall is plentiful. Pohnpei reputedly is one of the wettest places on earth, with up to 330 inches (8382 mm) of rain per year. Nevertheless, droughts occur periodically, especially when the El Niño condition moves into the Western Pacific, when groundwater supplies can dwindle. Tropical typhoons are an annual threat, particularly to the low-lying atolls. The volcanic islands have an interior of dense rain forest and soaring mountains, a coastal plain of ridges and winding valleys, and thick mangrove swamps along the shoreline. The ancestors of the Micronesians settled there over four thousand years ago. A decentralized chieftain-based system eventually evolved into a more centralized economic and religious empire centered on Yap. Nan Madol, consisting of a series of small artificial islands linked by a network of canals, is often called the Venice of the Pacific. It is located near the island of Pohnpei and used to be the ceremonial and political seat of the Saudeleur dynasty that united Pohnpei's estimated 25,000 people from about 500 C.E. until 1500, when the centralized system collapsed. European explorers—first the Portuguese in search of the Spice Islands (in present day Indonesia) and then the Spanish—reached the Carolines in the sixteenth century, with the Spanish establishing sovereignty. German took control in 1899. In 1914 German administration ended when the Japanese Navy took military possession of the Marshall, Caroline, and Northern Mariana Islands. Japan began its formal administration under a League of Nations mandate in 1920. 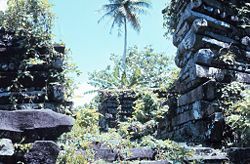 During this period, extensive settlement resulted in a Japanese population of over 100,000 throughout Micronesia when the indigenous population was about 40,000. Sugar cane growing, mining, fishing, and tropical agriculture became the major industries. World War II brought an abrupt end to the relative prosperity of the Japanese civil administration. During that war, a significant portion of the Japanese fleet was based in Truk Lagoon. In February 1944, Operation Hailstone destroyed many Japanese support vessels and aircraft at Truk. By the end of the war, bombing had destroyed most infrastructure, and the Japanese military had exploited the area to the point of impoverishment. The United Nations created the Trust Territory of the Pacific Islands in 1947. Ponape (then including Kusaie), Truk, Yap, Palau, the Marshall Islands, and the Northern Mariana Islands together constituted the trust territory. The United States accepted the role of trustee of this unique United Nations "Security Trusteeship." As trustee, the U.S. was to "promote the economic advancement and self-sufficiency of the inhabitants." On May 10, 1979, four of the trust territory districts ratified a new constitution to become the Federated States of Micronesia. The neighboring trust districts of Palau, the Marshall Islands, and the Northern Mariana Islands chose not to participate. The Honorable Tosiwo Nakayama, the former president of the Congress of Micronesia, became the first president. The federated states signed a Compact of Free Association with the U.S., which came into force on November 3, 1986, marking Micronesia's independence. Under the compact, the U.S. has responsibility for defense and provides money and assistance. The free association can continue indefinitely. Politics of the Federated States of Micronesia takes place within a framework of a federal, presidential, representative democratic republic, whereby the president is both head of state and head of government. The federation is divided in four states, Chuuk (Truk), Kosrae, Pohnpei, and Yap, and has its own constitution, elected legislature, and governor. The legislature is a unicameral Congress, which has 14 members elected by popular vote. Four senators, one from each state, serve four-year terms; the remaining ten senators represent single-member districts based on population, and serve two-year terms. The president and vice president are elected by Congress from among the four state-based senators to serve four-year terms in the executive. Their congressional seats are then filled by special elections. There is an appointed cabinet; there are no formal political parties, and political allegiances depend on family and island-related factors. The judiciary is headed by the Supreme Court, which is divided into trial and appellate divisions. The president appoints judges with the advice and consent of the Congress. The state governments maintain considerable power, particularly regarding the implementation of budgetary policies. The internal workings of the Federated States of Micronesia are governed by the 1979 constitution, which guarantees fundamental human rights and establishes a separation of governmental powers. In international politics, the Federated States of Micronesia are traditionally known as keen supporters of the State of Israel, voting almost consistently in its favor at the United Nations General Assembly. Economic activity consists primarily of subsistence agriculture and fishing. The islands have few mineral deposits worth exploiting, except for high-grade phosphate. Geographical isolation and a poorly developed infrastructure hinder growth and have inhibited the development of a tourism industry as well. Under the terms of the Compact of Free Association, in 2001 the United States provided more than US$84 million in Compact grants—an amount equivalent to over one-third of the Federated States' gross domestic product—plus more than US$20 million through other federal programs. The Federated States' public sector plays a central role in the economy as the administrator of the Compact money. The national and state-level governments employ over one-half of the country's workers and provide services, accounting for more than 40 percent of GDP. In 1996, to cope with an expected decrease in assistance, the government began a program of economic reforms to reduce the role of the public sector in the economy. The fishing industry is an important sector of the economy of the Federated States. Foreign commercial fishing fleets pay over US$20 million annually for the right to operate in Federated States' territorial waters. These licensing fees account for nearly 30 percent of domestic budgetary revenue. Additionally, exports of marine products, mainly exports of fish to Japan, account for nearly 85 percent of export revenue. The Asian Development Bank has identified tourism as one of the federated states' highest potential growth industries. Visitor attractions include scuba diving, World War II battle sites, and the ancient ruined city of Nan Madol on Pohnpei. Some 15,000 tourists visit the islands each year. Farming is mainly subsistence level, and its importance is declining. The principal crops are coconuts, bananas, betel nuts, cassava, and sweet potatoes. Less than ten percent of the labor force is involved in, and less than seven percent of export revenue comes from, the agriculture sector. Manufacturing activity is modest, consisting mainly of a garment factory in Yap and production of buttons from trochus shells. The large inflow of aid allows the Federated States to run a substantial trade deficit and to have a much lighter tax burden than other states in the region (11 percent of GDP in the federated states compared to 18 percent to 25 percent elsewhere). The government borrowed against future Compact disbursements in the early 1990s, yielding an external debt of US$111 million in 1997 (over 50 percent of GDP). GDP per capita was US$3,900 in 2002. Exports totaled US$22 million in 2000. Export commodities included fish, garments, bananas, and black pepper. Export partners were Japan, United States, and Guam. Imports totaled US$82.5 million. Import commodities included food, manufactured goods, machinery and equipment, and beverages. Import partners were the U.S., Australia, and Japan. The unemployment rate was 22 percent in 2000, and 26.7 percent of the population was living below the poverty line. The population was estimated as 110,000 in 2005. Population growth remains high at more than three percent, ameliorated somewhat by net emigration. The average life expectancy is 68.63 years. The indigenous population of the Federated States of Micronesia, which is predominantly Micronesian with some Polynesian, consists of nine ethnolinguistic groups. Individuals maintain strong ethnic affiliations. Ethnic differences are often behind political contention between the states and contribute to local disputes. Before Christian missionaries arrived in the mid-nineteenth century, beliefs focused on the activity of ancestral spirits, a pantheon of deities, and the numerous other spirits, both kind and malevolent, that inhabited the earth, sea, and sky. Today, about half of the population is Catholic and half belong to various Protestant denominations, most notably the United Church of Christ. Many Micronesians still believe in the power of deceased ancestors to influence events, and the existence of spirits and spirit possession. Elements of traditional culture, such as competitive feasting and the harvest of first fruits, have been incorporated into church calendars. People can be found preparing for, or celebrating, a church-related event almost every day. Churches are often the most conspicuous buildings in Micronesia. English has become the common language. It is taught in schools and is widely known, but it is the second language for most Micronesians. The country has seven official languages: English, Ulithian, Woleaian, Yapese, Pohneipean, Kosraean, and Chukese. Every inhabited island has a distinct language or dialect from the Austronesian (Malayo-Polynesian) language family. With the exception of a few Polynesian outliers, the languages spoken among the islanders of Chuuk, Pohnpei, Kosrae, and the coral atolls of Yap State are classified as Nuclear Micronesian. Yapese mainlanders speak a Western Micronesian language. Although polygamy was practiced, monogamy has prevailed since Christianity arrived. Many marriages are arranged with the consent of prospective spouses, and unions that create family alliances and concentrate land, wealth, and status, are favored. Most marriages take place in church, but are often preceded by common-law unions. Formal marriages involve the exchange of gifts between the families and feasting, and may involve the transfer of land. Either spouse can initiate divorce, which is less common among couples with children. Households are often composed of extended kin, although there is a trend towards nuclear families. In Pohnpei and Yap, the household may consist of a joint family of brothers, their wives, and children, or a stem family that includes multiple generations of father-son ties. In Chuuk and Yap's outer islands, households are composed of related women and in-marrying husbands. Status on the high islands is determined by descent group affiliation, seniority, and the relationship between people and the land. Age, gender, achievement and specialized knowledge, kinship affiliation, and land claims are important on the more egalitarian coral atolls. Achievement in the market economy earns status and has eroded indigenous status distinctions. Respected elders or title-holders may receive the first share of food at a feast, or may be seated in an honored position. Automobiles, appliances, food imports, and Western-style houses and dress have become symbols of economic success. The island of Pohnpei is notable for the prevalence of the extreme form of color blindness known as maskun. More traditional open-sided houses constructed using wooden posts with thatch roofs are being replaced by homes made of concrete block or poured concrete with corrugated iron roofs. Urban homes feature modern kitchens, bathrooms, separate bedrooms, and driveways for cars. In rural areas, separate cookhouses, bathhouses, and boathouses predominate. Meals usually consist of a starchy carbohydrate, and fish or chicken, and may include a variety of fruits. Taro, breadfruit, yams, sweet potatoes, and cassava are the primary starches. Meat, usually fish, is also considered essential. Hundreds of edible fish species are available as well as marine turtles, shellfish, and crustaceans. Chicken and pigs are reserved for feasting. Fruits include coconut, banana, papaya, pandanus, mango, and a variety of citrus. Children are taught to be cooperative, generous, sharing, and respectful. Education of children involves a combination of formal schooling and informal acquisition of gender-related knowledge and skills. Formal education is mandatory and most children attend grade school between the ages of five and 14. More families are sending children to high school and college with the hopes of providing them greater access to employment. Only 27 percent of males and females between the ages of 18 and 21 attend college. Most of these students are enrolled at branch campuses of the College of Micronesia, while a limited number receive scholarships to study at colleges in the United States. Eighty-nine percent of the population aged 15 and over can read and write. The island of Yap is notable for its "stone money" (Rai stones): large disks usually of calcite, up to 12 feet (four meters) in diameter, with a hole in the middle. The islanders know who owns which piece, but do not necessarily move them when ownership changes. There are five major types: "Mmbul," "Gaw," "Ray," "Yar," and "Reng," this last being only 12 inches (300 millimeters) in diameter. Their value is based on both size and history, many of them having been brought from other islands, even as far as New Guinea, but most having been brought in ancient times from Palau. Approximately 6,500 of the disks are scattered around the island. Traditional music varies widely across the four states, and has recently evolved into popular music influenced by Europop, country music, and reggae. Traditional dances on the main islands includes stick dance on Pohnpei, Chuuk, and Yap, standing dances on Chuuk, and sitting dances on Yap and Chuuk. The Yapese are particularly known for their skills in dancing. The Yapese stick dance is performed by men, women and children together, while the standing dances are performed by either women or men and boys, but never both together. The men participate in various dancing competitions, which are segregated by caste. The lower castes have some distinct dances, such as a woman's standing dance, but may only dance when authorized by a person of a higher caste. Chuuk shares many similar dance styles with Yap because of their similar cultural heritage. Chuuk's most mysterious and rare dance is called the "Moonlight Dance." It is one of the few dances that men and women dance together. The "Moonlight Dance" can be performed only during a full moon with permission from the village chief. Traditionally speaking, this was a way for young men and women to get together. ↑ Department of Economic and Social Affairs Population Division (2009). World Population Prospects, Table A.1. Retrieved January 19, 2012. History of "Federated States of Micronesia"
This page was last modified on 4 April 2017, at 20:43.